I know exactly what you are thinking, and I want to be clear that it isn’t my fault. It all started because I enjoy writing about my adventures, but find it difficult to think of good titles. Finally, in desperation, I asked my traveling companion if he had any ideas. After hearing his suggestion, I’m beginning to think that his great idea for the title of my web site was pure luck, and that he isn’t very good at thinking up titles either. Unfortunately, since I did ask him, it would be rude to ignore his suggestion. To make matters worse, he is now excited about picking titles for all my adventures. I thanked him, and said I’d have to think about it. I’m a little afraid I may be stuck with his titles from now on. Oh well, enough about that; it is time to tell you about another adventure. As you know, I had a very busy fall and I traveled half way around the world. The adventures were wonderful, but by December I was ready to stay home and see my grade 3 friends for a while. 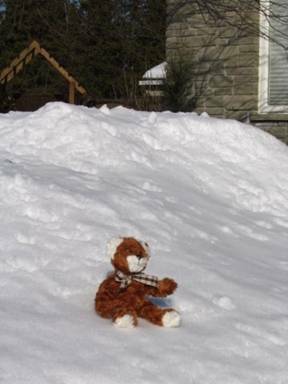 Fortunately winter was in full swing by then in Stittsville, and there was lots of snow for me to play in. The snow banks were so high that it almost reminded me of the mountains in Geneva. I’m exaggerating of course, but not by as much as you might think. There was an awful lot of snow, and it made playing outside even more fun than usual. When the fall school term ended, everyone went home for Christmas break, including me. Actually, I didn’t quite go “home”. I would have loved to go back to Geneva for Christmas, but I knew that wasn’t practical. Besides, I had another trip to Geneva planned for January, and I could wait. Bears like Christmas, but not nearly as much as people do, so seeing my family and friends in January would be just fine. It also meant that I would get to spend Christmas with my traveling companion and his family, and I knew that would be a real treat. I’d never spent Christmas with people before, but I’d heard many stories about the food and presents. When I heard that some people are even known to tell stories at Christmas, I knew that it was the place for me. This story is about Miami rather than Christmas, so I won’t say anything more, except that I had a wonderful time. 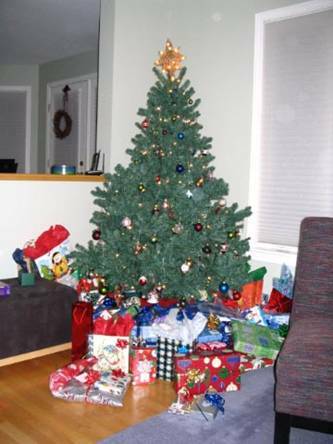 Some of the presents under the tree were even for me. I really wasn’t expecting that, but it was fantastic, and made me feel like one of the family. Miami was, to be completely honest, nice. It wasn’t fantastic, but it was nice. I know what you are thinking now, and you are right. The title my traveling companion suggested was accurate, but that doesn’t change the fact that it was lame. We stayed near the airport, so there really wasn’t much to see, but the hotel did have a nice pool. 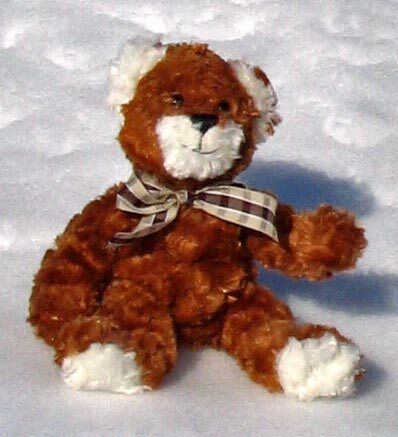 After all the time I’d spent in the snow over Christmas, it was pleasant sitting around relaxing in the sun. It was warm, but not hot, which is ideal for me. When it gets too hot I find it quite uncomfortable with my thick fur coat. And don’t even think about suggesting I take it off. 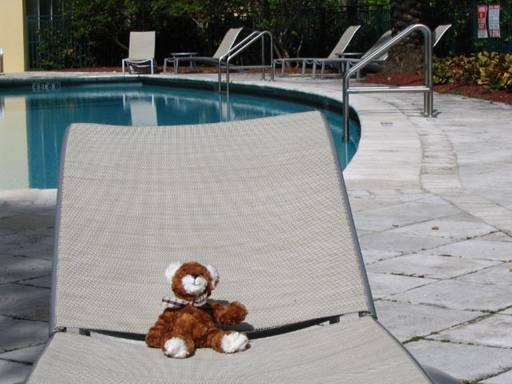 When I did get a bit hot, I just jumped in the pool for a short dip, and I was comfortable again. 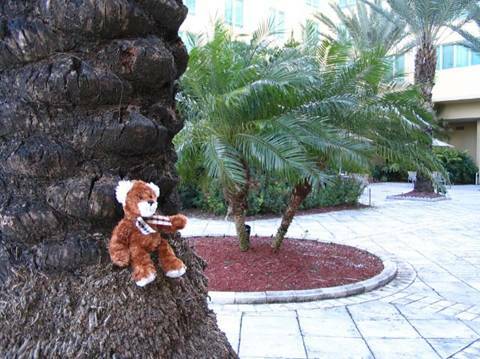 The pool was relaxing, but I was also able to have a bit of fun around the hotel. I don’t like climbing trees in the winter because they are frozen, and sometimes they can snap off. Falling out of a tree can hurt, even when there is snow to cushion your landing. It had been some time since I’d climbed any trees, so when I saw the trees around the pool, I couldn’t wait for a little practice. I was having a great time, when a businessman came out for a little break from his meeting. Of course I sat very still as I always do when people are around, but he decided to take a little nap on one of the deck chairs. I was getting very hot, so finally I decided to risk coming down even though he was still around. Just as I reached the ground, he woke up, saw me, and went running into the hotel screaming that there was a bear by the pool. By the time the hotel staff came out, I was long gone, but it gave me an idea. First, I want to tell you that I would never do something like that if there were kids by the pool, but they were all in school. And the people around the pool weren’t on holiday; they were in meetings in the hotel, and just sneaking out for a break. So I really didn’t feel all that guilty when I hid in the trees, and then came down and scared them. I probably won’t do it again, but it sure was fun doing it on this trip. Before I knew it, the trip was over and we were back in Stittsville. 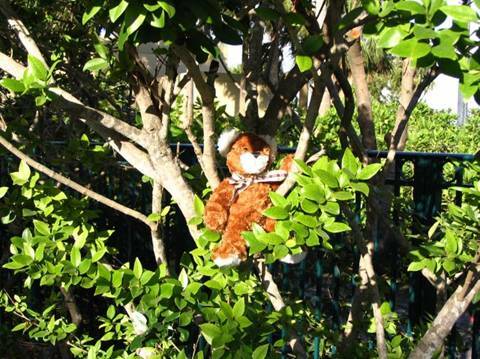 My grade 3 friends thought the pictures of me on the lounge chairs were cool, and they laughed when I told them about hiding in the trees and frightening people. I know it was sort of cruel, but it didn’t really hurt anyone. And besides, if they had stayed in the meetings like they were supposed to, I never would have scared them. Honest! I had a few more days to play in the snow, and then it was off to Geneva for my first visit home since beginning my adventures.